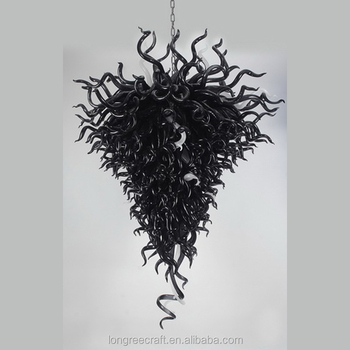 Sure to make a bold statement, this light fixture features 110 - 120 pieces of hand blown glass. This chandelier is comprised of many different types of glass stems varying in length 5" - 10". Uniquely hand blown pieces of aqua glass with clear tips will give a presence that demands attention in any room. Many finish are available as the customer’s requirements. 10-staff design team, new designs are available each month. A.What size and shape is best for my home or business? Placement ultimately determines both, LONGREE Glass Art Chandelier "Rule of 3" quickly simplifies Size, Position, as well as Color. B.How difficult are they to install and maintain, and can I do it myself? If you can hang a ceiling fan, you can install a chandelier. Aside from supporting weight (customarily 1.5 lbs. /stem), the attaching, positioning, and rotating of each stem is actually the longest time aspect, but the most fun part of the installation. Maintaining is easy using condensed air for cleaning and with bulb replacement accessed through the top. C.Can I custom mix and match colors and which are best for me? Yes, perhaps the most personal and challenging; referring to the "Rule of 3", try to limit to 3 surrounding/desired color elements. Select the primary and adjust the remaining in descending percentages. D.How do the chandeliers ship and how long does it take? Shipping experience is key, LONGREE Glass Art fully insures, individually packages each stem, and provides a few "just in case" extras in the event of the unexpected. Shipments customarily arrive in as little as 2 -3 weeks. We're available 7 days a week by call or via email.